Christmas bonuses are now less than 90 days away. This notion is important because receiving a Christmas bonus or year-end bonus for some people can adversely skew the bankruptcy means test and make them ineligible for Chapter 7 bankruptcy. The bankruptcy means test is a very comprehensive, very complex series of calculations that the federal government designed to ascertain whether someone qualifies for Chapter 7 filing. It was designedas part of the new bankruptcy laws to prevent those consumers who have high incomes from being able to eliminate their debts in Chapter 7 cases. See my post, The Means Test is Often the Key to a Successful Chapter 7 Bankruptcy Case . The means test looks at all income you received during the prior six calendar months. Some people just barely qualify for Chapter 7 filing because they just barely pass the means test. If you are on the edge of being eligible, adding a significant year-end bonus into the calculation of income can preclude you from being able to file for Chapter 7 bankruptcy relief. What this means: if you receive a substantial Christmas bonus in December, you might have to wait as many as six months before being eligible for Chapter 7 filing, because the means test requires that you add up all income received in the previous six calendar months. What you should do now: if you are considering filing for bankruptcy, and your income appears to be substantial, you should file bankruptcy before getting any year-end bonus. How do you know if your income is considered substantial enough? The only way to find out is to consult with an experienced consumer bankruptcy attorney. One additional caveat: if you know for sure that you are receiving a year-end bonus, then this should be reported on the bankruptcy petition budget schedules as anticipated future income. Doing so has no effect on the means test, but may nevertheless show that there is extra income in your budget. An experienced bankruptcy attorney can discuss how to deal with this concept. Right now, so many companies are cutting back that there may be no way to know if you are going to receive a Christmas bonus this year. Thus, you may be better off filing sooner, rather than later, because at some point between now and Christmas, your employer may inform you that you will receive a year-end bonus. Empire Masonry Contracting Corp., of East Setauket, New York, filed for Chapter 11 bankruptcy relief on September 14, 2009 in the Central Islip Bankruptcy Court under case number 8-09-76876. Judge Robert E. Grossman is the assigned bankruptcy judge. This is a Chapter 11 case that is one of my own cases that I, Long Island Chapter 11 bankruptcy attorney, Craig D. Robins, Esq., filed. The amount of the pre-petition retainer for legal fees and disbursements was $15,039. The debtor provides commercial masonry services in the New York metropolitan area, has several ongoing jobs, and is solvent and operating profitably. It has gross revenues of several million dollars per year. According to the Chapter 11 Affidavit filed with the Court, the debtor fell behind with its financial obligations and now requires bankruptcy relief because several large, slow-paying accounts drove the debtor into a position of low liquidity, preventing the debtor from maintaining timely payments to creditors, primarily withholding taxes it owes to the Internal Revenue Service. In addition, the type of contracting services the debtor provides requires that a portion of each contract be set aside as “retainage” until the completion of construction. Despite the retainage amounts being held back as assurance for the quality of work, the retainage sums recently have taken an extended time to obtain.The debtor anticipates quickly obtaining confirmation of a Chapter 11 plan of reorganization which will enable it to pay all creditors in full. The Meeting of creditors will be held on October 16, 2009 at the United States Bankruptcy Court for the Eastern District of New York in Central Islip (Room 562 at 10:00 a.m.). The first Status Conference before Judge Grossman has not yet been scheduled. Fraudulent mortgage rescue schemes is reaching an “epidemic.” This is what several federal and state agencies said last week in a joint press conference as they pledged to increase efforts to investigate and crack down on loan modification abuse and companies offering help for homeowners. 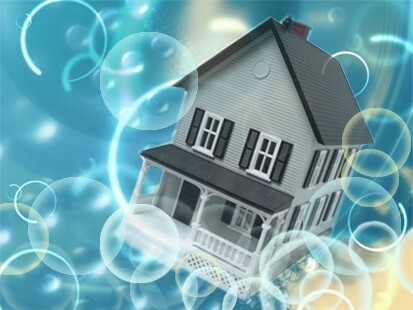 Many Americans who have been caught hard by the recession and are scrambling to avoid foreclosure have become easy prey to dishonest mortgage modification companies. .This is especially prevalent here on Long Island where I regularly meet with clients in my Long Island foreclosure defense and bankruptcy practice. I frequently hear tales of woe from clients who paid thousands of dollars upfront to companies who promised them the moon, but sadly produced absolutely no results. 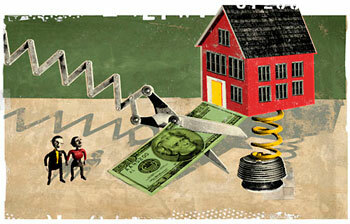 See my previous post: Can You Trust a Mortgage Modification Company? Now the Federal Trade Commission is considering an outright ban on upfront mortgage modification fees because so many dishonest companies have taken advantage of innocent homeowners. In addition, the U.S. Treasury, Department of Housing and Urban Development, and Justice Department said they plan to alert financial institutions to emerging mortgage modification schemes, step up enforcement actions and educate consumers. The FTC also said that when a mortgage modification firm asks for an advance fee, it’s a red flag that the service is bogus. Another common problem involves the many companies who use deceptive advertising that is designed to trick consumers into thinking that they are participating in a government program. Meanwhile, the FBI announced that it has over 2,600 mortgage fraud cases open, most of which involve substantial losses of more than $1 million. Some Long Island homeowners have actually lost their homes because they relied upon mortgage modification companies to save them, but the companies utterly failed to do anything other than take their money. Although my office provides bankruptcy and foreclosure defense legal services, we do not do mortgage modifications. For that, we recommend obtaining free help from government-approved housing counselors.. Homeowners can locate free government-approved housing counselors at http://www.makinghomeaffordable.gov or by calling (888) 995-HOPE. 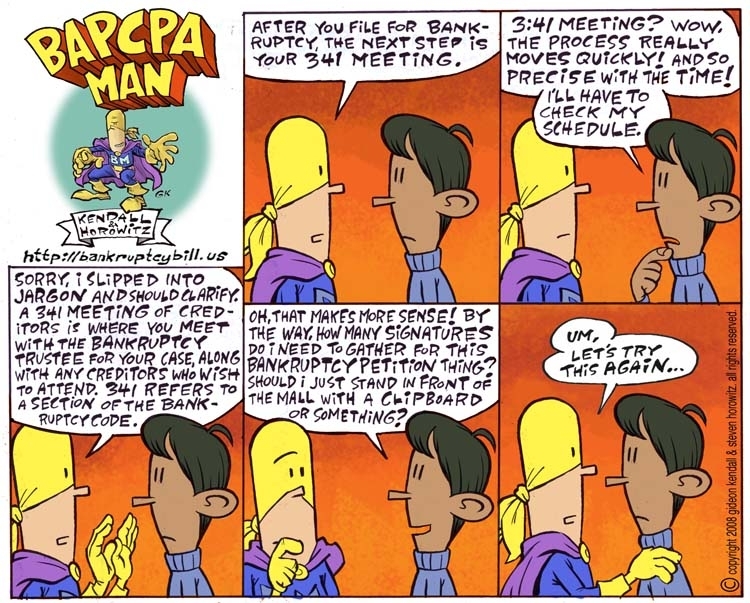 I am pleased to post the fifth cartoon strip of BAPCPA MAN, the new comic strip from New York bankruptcy attorney Steven Horowitz and and artist Gideon Kendall. Here is strip number five. BAPCPA MAN is designed to entertain both consumers and bankruptcy attorneys. The strips seek to educate consumers, humor attorneys, and will also try to poke fun at some of the more ridiculous requirements of the new bankruptcy law. Please check out the Bankruptcy Bill and BAPCPA Man Website which now has references and links to other bankruptcy blogs around the country. For ages, buyers of real estate were told that they should always stretch financially when buying their first home. However, the recent resettling of the real estate market has blasted that maxim out of the water. As a consequence of that good-natured, but ill-conceived advice, hundreds of thousands of Americans now have homes with no equity at all and are considering bankruptcy as a way out. An article in the New York Times last week (Seven New Rules for the First-Time Home Buyer) said that too many people bought too much house for too many years. Although our country’s financial system almost collapsed because of the sub-prime mortgage meltdown, the article suggested that consumers should share some of the responsibility. Unfortunately, few home buyers anticipated such significant corrections with real estate values. They also were blinded to the excited sales pitches of mortgage brokers and real estate sales agents about exotic mortgages that reset to rates that can become unaffordable. A very large number of Long Island home buyers fell victims to this home buying euphoria and are now paying the price — something I see daily in my Long Island bankruptcy law practice. Now, financial planners and economists are rejecting the idea that first-time home buyers should get as much home as they can afford. The Times article spells out some new, common-sense guidelines that home buyers must consider, like placing a down payment of at least 20%, and not spending more than 35% of pre-tax income on the mortgage payment, including real estate tax and liability insurance. The purchase of a home, once thought to be a no-brainer as far as being a safe investment, must now be approached cautiously. For those home buyers that have found themselves in an untenable real estate situation, combined with excessive debt, bankruptcy can often provide a solution to getting out of a bad real estate home investment and getting a fresh new financial start. We have helped many Long Island homeowners do just that with Chapter 7 bankruptcy. C.D. Autos, Inc., a Mazda car dealer, filed for Chapter 11 bankruptcy relief on August 27, 2009 in the Central Islip Bankruptcy Court under case number 8-09-76424. Judge Alan S. Trust is the assigned bankruptcy judge. The debtor is a Nassau County car dealer who does business as Mazda Automobiles of Great Neck at a facility located at 240 Northern Blvd., Great Neck, New York. The company, which is located in Great Neck, is being represented by Nassau County bankruptcy attorney Kenneth A. Reynolds of McBreen & Kopko. No disclosure of Compensation was filed. Most of the schedules, which were required to be filed by September 8, 2009, were not filed in a timely fashion. The Debtor’s bankruptcy filing was necessitated by the fact that the New York State Department of Taxation had padlocked the Debtor’s car dealership thereby depriving the Debtor of its ability to operate its business, which failure to operate constitutes a breach under Debtor’s Mazda franchise agreement. The Meeting of creditors will be held on October 2, 2009 at the United States Bankruptcy Court for the Eastern District of New York in Central Islip (Room 563 at 9:00 a.m.). An emergency motion for use of cash collateral was held before Judge Trust on August 28, 2009, and adjourned to September 9, 2009. There have been some massive job layoffs in this deep recession, even for professionals and upper level executives. Consequently, many recently-laid off workers are being forced to rethink their professional identities, their personal relationships and how they will manage their existing debt. The current financially-plagued economy seems to be sparing no one. Even white-collar workers with advanced degrees, working at prestigious companies, are not immune. Anyone can lose a job. Wall Street firms have not been kind; advertising and retail are suffering greatly, and many question the viability of garment industry jobs remaining in New York. According to studies by organizational psychologists, white-collar men tend to experience unemployment differently. For them it is sometimes difficult to adapt and find a job to provide income if that income is significantly less. 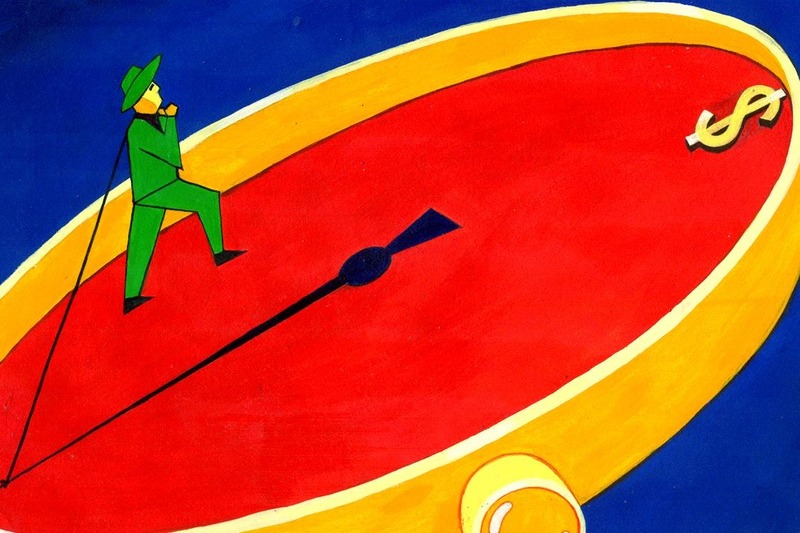 Grappling with joblessness inevitably entails surrendering an idea of who they are. Negative emotions abound. 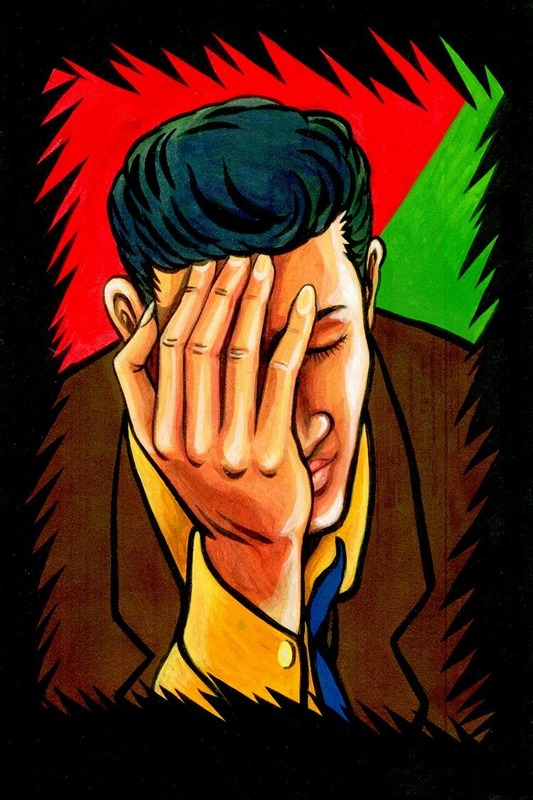 I’ve previously written about the Eight Steps to Cope with Emotional Issues During Bankruptcy as well as The Emotional Side of Debt and Bankruptcy . To those who qualify, bankruptcy can often provide a solution for eliminating substantial debt. This usually has a very positive effect on the psyche, eliminating a large source of anxiety and depression. The bankruptcy option should be discussed and considered well before the raiding of 401-K and other retirement accounts. (See Are Pensions Protected in New York Bankruptcy Cases? ). In my Long Island bankruptcy law practice, I frequently see clients who previously earned six-figure incomes. Bankruptcy can provide an opportunity for a fresh new financial start and remove some of the pressure of finding new employment.